Its the night of ghosts and goblins, and trick or treaters gone mad and all thru the streets children are getting home with tired feet, and bags of goodies galore. Roo and I left for a night of scares and treats at about 6:45 and got home about an hour later. Roo the mermaid dug into her candy and quickly surmised there were candies she would eat, so to the door she quickly went to hand out treats to the few revelers left outdoors. Then in she came like a dash to sort and stack and see what she had amassed. Tired and happy we took pictures of one great haul. Roo is busy munching and filling freezer bags with chocolate galore. Gum and candy in one bowl, chocolate in another and chips are in the big bag to count and sort and nibble while we watch a movie till a child sleeps and mom can visit some blogs. Now the thing every parent will of a school age trick or treater will be asking is what to do with all that candy..Roo usually brings home a pillowcase full….can you say candy mania! Tonight I let her eat as much as she wants! Maybe I spoil her too. But after tonight things change in this house rather quick, and I become the Grinch that stole the Halloween candy. After tonight this cheap mom lays down the law…. 1. The cookie jar becomes the candy jar for the month of Nov…roo favorites go in here and she is allowed one a day…Don’t they say one a day keeps the doctor away? Wait that is for apples. 2. Chocolate bars that mom can get my hands on go into the freezer, these make great inserts for baking, and don’t you know frozen chocolate takes longer to eat making the treat last longer. 3.Think math concepts: sorting and stacking and grouping all help our lil ones learn math skills…do we have any future bankers? 4.Think craft time: Have you ever seen a candy tree? or strung life savers to make an edible necklace. 7. Okay another craft idea Christmas ornaments….do I have you thinking, huh, Okay Hollie must be nuts or she has too much time on her hands. Oh and I love the big oneas we go out early Roo instantly recycles her candy…anything she doesn’t like goes out to the late trick or treaters( you know the teens). So with that send and done all the candy disappears quite quickly thank goodness. Save candies for the gingerbread men and house, put in a sealed container or ziploc baggies to keep fresh. Well time for this parent to get ready for this LONG day. May you not get too spooked tonight. Today I woke up and thought what a great day for a walk around my favorite sites, and then I realized I have much work to do! Why? Because Christmas is in 55 days! I know Halloween hasn’t even passed yet and here I am thinking of Christmas, but in this house I am not only getting ready for Christmas but both me and Roo have birthdays over the holidays! Can you say stress for this cheap mom! There are lists to be made, gifts to be made, visiting to be done, don’t forget parties to attend, concerts to listen to and so much more. This time of year makes us get to Jan 3rd( the day after Roo’s birthday) and collapse in exhaustion. Well NOT this year! Being the wonderful cheap mom that I am I have a plan- boycott Christmas! Not really but I think this year I am ahead of the game and will be able to pull off a frugal Christmas, that still exudes the excitement that comes with the season…so for the next 55 days look ahead with me to that great day, and lots of frugal tips along the way. TIP#1: Decide what about Christmas is important to you and your family. Make this the theme of your Christmas. Christmas is a time for traditions and values to come to a forefront. Here in our house what matters most is family time! So there will be lots of that as we work, shop and play together this holiday season. 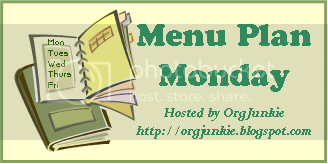 I love Menu Monday that the one and only organizing junkie hosts every Monday and have decided it is one way to help me organize my weeks oh so much better. Menu planning is so important. If you are visiting her today you even get to welcome her to WordPress! So what am I cooking this week? I am a use the flyers kind of gal and what can I buy on the cheap that is still going to give me and Roo a healthy week. New vs Used that is the question? I have been thinking about this especially when it comes to how I shop.Do I buy new out of habit or brand allegiance could I change this and save money. There are certain things that I buy that have to be a certain brand even if they cost more. When it comes to these goods, I think it is because I am a smart or should I say, the wise consumer. Now most of what I buy is used. When it comes to clothing, I buy used mostly. I love the feel of a pair of well-worn jeans. Now who likes to break in a new pair? I went shopping this week at Value Village and used one of the $35 GCs that I won last week at stocked up on a few wants: one was a beautiful silk red blouse($4.99) that will look great over my basic black dress( also a VV find for $7) for the holidays. I love like this and I cant tell you how many compliments I have gotten on my brown leather bag that I got for $3.99. Yes I know by buying clothes second hand you have to bring them home and wash immediately etc., and you don’t have the latest trendy items, but I am a classic vintage gal, so it works well for me. When it comes to furniture, I buy used, and you can always find great deals either on Kijiji or Craigslist. There is not a new piece in my apartment. Now this means my apartment is a variety of looks but that again is ok with me, but I guess if you are trying to achieve a certain look then you might buy new. As for colors in my apartment, I use throws and pillows to bring things together. When it comes to electronics unless it has been gifted to me( i.e., my current tv I buy new). My computer was a great deal when I bought it two years ago ( for $349). I got the last one Staples had when they were clearing out stock for me it has more then served me well. My MP3 player was a gift with a purchase I made. For my music needs, I don’t buy CDs anymore if there is a song I like I can usually get it for free? I enter and win enough downloads from contests through the year. I have not paid for music in over a year thanks to Rip to Win and the other contests that have netted me 56 downloads in the last six months. If you like music, don’t buy CDs download them it is so much cheaper! Now if my location ever changed( living in the heart of Toronto allows me to be a walker and TTC user) and I had to buy a car, I would buy used. A car loses much of its value as you drive off the lot. When it comes to groceries, this is where I skimp a lot without losing quality. Dominion here has the fresh or free policy which nets me about $30 a month in free quality groceries simply by checking expiry dates. I also coupon collect. Save.ca is great for coupons and then there are coupons that line the store aisles. There are certain foods where the store brand simply will not do. We buy real Kraft dinner and Campbell’s soups only. They are the main stays of our lunches. For cookies, I bake or go to the factory outlet for them. I spend about $200 a month for the both of us and that includes cleaning and bathroom stuff too. Now when it comes to toys here is where you have to be careful. Our kids come first right! I buy new mostly–mostly at Walmart or Toys R US when on sale. We have bought some toys second hand ( like Roo’s kitchen), a Barbie dollhouse, and the like. We have bought games second hand at garage sales after checking to ensure all the pieces are there. As for books we love second hand and make great use of the library. So does my use of second hand make me cheaper then cheap? I think it makes me a great consumer and a money smart mom. Today it is a wet yucky fall day here in Toronto, so what does a frugal mom do with her child on a day like today? First off Roo loves her computer time. On the weekends, I let her have an hour. Her favorite websites are Webkinz ( Mom rates this a great site with a cheap cost), Champman’s Kids Club( you can even earn stuff they will send you for free), TVOkids and Link to Learning( a great site for educational learning put out by the province of Ontario). Then there is craft time: I keep an ample supply of craft items on hand, and then we have our recycling bin of course. Roo often raids it for her latest creations. This week she used old bits and pieces to make a webkinz house for her stuffed ones and furniture too. Another of our favorite activities when we just have to get out of the house is to go to the library to read together. Roo and I both like this as it gives us some nice time together. Sometimes we go to the mall and go window shop. I am able to gleam as we go some great ideas for Christmas shopping. Games are another favorite in this house. I have been able over the last to collect quite a few from second hand stores and garage sales ( just make sure you check that all the pieces are there). We often do family movie time. We can rent from our local store a new release for $1.99 or we have about 50 dvds that we own. I put on the popcorn popper add some real butter and we are good to go. Who needs a movie theatre! Baking is another way to chase away the rainy day blues and think they are learning important math skills too. So many things to do, what are your favorite ways to chase away the rainy day blues on the cheap? So I started thinking of the choice I made to be here while Roo was getting diagnosed and stable.What did I give up to become this cheap momma that I am? 1) An hour commute each way to work.I take transit and rush hour traffic is not a good thing. I was glad to see this go! 2) Adult interaction-I have been blessed because I still get this because I volunteer, and the thing about volunteering it often comes with freebies or hidden benefits. 3) Eating Out- We eat at home. I can buy a pizza on sale for $3.99 instead of doing the $20 order in, or make great hamburgers instead of a trip to the golden arches. I also take snacks on on many of our day trips. 4)Going to the Movies- Okay this is one I miss, but when Coke has their movies passes on for my coke coins, I stock up. Then a movie costs the total of a box of popcorn. Other wise we use the library for our rentals. 5) New clothes and shoes–Yes I can”t buy at the beginning of the seasons for Roo and me. What I have found are some great consignment and second-hand shops. Did you know you can wardrobe a nine yr old for under $100 a year? For me, I buy when I need and make do! Thank goodness for the classic look. 6)Visits to the salon. Instead of spending $100 for my cut and color. I now color myself and go to the hairdresser once every ten weeks. So have I had to give up much? Or am I now wealthier in ways that matter? I figure I am time rich. I can sit and read to Roo when she wants me, I am the one helping with homework and am in the school, so I am a mom in the know. I have time to give in my community, and that brings blessings. I can bake cookies when I want or visit the sick or do so many things that I couldn’t do when I worked full-time. This conversation over coffee (diet coke for me) made me stop and think about that choice I made, and I am thankful that I am now this cheap mom who is as wealthy as I need to be! I am a frugal mom and at the beginning of the school year, I thought this year I want to go without buying juice boxes, without spending a mini fortune on baggies. I was tired on all the spending and waste I was creating. I came up with a plan this was going to be the year of the garbageless lunch. I went out a got a thermos, a sandwich’s box( actually got four cause well they are a great size for many things), , travel and a refillable juice container.For me, this works and works well and think it is good for the environment too! It seems everyone is getting on the going green band wagon, and with yesterday being Global Action Day there were lots of great ideas on many blogs. For me, I have been finding simple and cheap ways to reduce, and recycle and even renew. We even had a garden this year. Now even Roo’s school is going GREEN and this weekend we are hosting a Fall Festival that hopefully will be garbageless. We are having a skate swap, a book exchange, raffles, bake sale and games for the kids. All with no garbage. There will be water-bottles; travel cups are encouraged, bake sales items are in paper bags with peek thru windows, even the donations will be in reusable baskets. There are no candy prizes. Instead, we encouraged the recycling of small toys for prizing. We are trying hard, even some of the items being won in the raffle encourage reusing like the $70 in Gift certificates for the local Value Village or the good reusable water bottles. Even our meetings are now mostly paperless.